I've been mostly working on this year's holiday card. Except, while the holiday card is still scattered on bits of tracing paper, I was distracted by the need to smear paint on the cover of my current journal. I started with sandpaper, added some wire, beads, a mangled screw top from a bottle of wine and a strip of muslin. All this was grunged up with raw umber acrylic and more sandpaper. I brushed some curvy lines on the muslin with india ink. There's also some ink splatter that hit while the journal was in the role of innocent bystander. 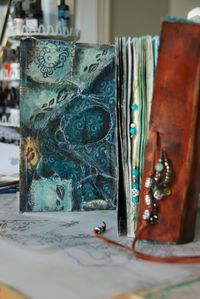 On the inside cover there's another mess made of fabric, paint, gel medium and stamps. All this has resulted in an aged and mysterious looking cover. You may expect to find magical spells, fantastical illustrations or romantic stories inside such a book. Wouldn't that be fun? That would be in another journal that is not mine. I usually avoid beginning a journal with so many pages. I lose interest, get tired of looking at the drivel I've scrawled in the pages and move on to a fresh, new volume. This time something is different. First of all the pages aren't very friendly to most of the mediums I like to use. EVERYTHING bleeds through to the next page or two or three. Nice paper but it's like writing on a super-absorbent paper towel. My solution has been to brush a coat of acrylic paint on many of the pages. Another idea was to paste a couple of pages together here and there. Mostly the marker spit doesn't make it through the glue to the other page. This flimsy paper means extra steps but I don't seem to mind. Is it the cover that invites me to put something interesting inside? Is that why I'm not feeling anxious about moving on to another book? Sounds like prime psycho-drivel to be hidden deeply behind the fab cover. There are some interesting pages inside but nothing like what the cover might suggest. So long as the cover is closed and bound it's fun to imagine what might appear next time it's opened. Are there journal fairies that specialize in mysterious journals? Elves? Could I hire some? Back to the holiday card. Focus.